A dynamic urban center, the City of Bloomington is home to more than 85,000 residents and 100,000 employees. As the city continues to renew its commitment to investing in the community, the South Loop District is undergoing some major changes to pave the way for future expansion near the Mall of America (MOA). Those changes include the $49-million Lindau Lane Corridor project, a major transportation initiative that--when completed in 2014--will transform the area into a model for sustainable commerce and living and improve driver and pedestrian safety. Lindau Lane Corridor Project. 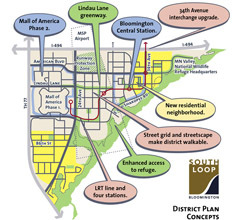 An estimated 65 percent of the City of Bloomington’s growth over the next 30 years will occur in a distinctive urban hub known as the South Loop District, an important commercial and employment center (located south of the airport, east of Trunk Highway (TH) 77, and north of the Minnesota River). In 2012, the City of Bloomington partnered with SRF Consulting Group, Inc. and Kimley Horn and Associates, Inc., to help prepare portions of this area for impending expansion. Currently under construction, the SRF/KHA team completed the final design on a portion of the Lindau Lane Corridor project, including the TH 77 Lindau Lane Ramp Safety Improvement and the Lindau Lane Grade Separation. Lowering Lindau Lane by approximately 20 feet to allow the mall to expand over the roadway. This will facilitate transit movement through the district and reduce vehicle/pedestrian conflicts to improve pedestrian safety across Lindau Lane. Changing Lane configurations on Lindau Lane to allow for improved safety for vehicles accessing the area from TH 77. Extending Lindau Lane (from 24th Avenue to 30th Avenue). Designed by the City of Bloomington, this will improve vehicular and pedestrian access within the district. Constructing a new bridge over Lindau Lane, which includes a pedestrian and vehicle plaza that will support the Mall’s future expansion over the roadway. In addition to providing safer and more efficient access to MOA, the new bridge creates opportunity for at-grade expansion of the mall by allowing for more advantageous first-floor retail and commercial development. Streetscape and landscape improvements that add to the street’s appeal, blend with the existing aesthetic treatment while allowing the shift from the existing to a new vision, establish a comprehensive look throughout the district, and provide community gathering places. Watermain and sanitary sewer replacement and extensive storm sewer system improvements. Extensive coordination with private utilities. From Planning to Reality. Lindau Lane’s proximity to some of the country’s largest shopping venues and major tourist attractions requires a coordinated project approach that carefully balances private sector needs and public infrastructure requirements. Prior to beginning construction in May 2013, the city and the SRF/KHA team worked through several key issues--from construction staging and traffic management to public safety and infrastructure reliability--to ensure the Lindau Lane project honors the city’s end goal of strengthening the community while minimizing disruption to the traveling public during roadwork. The project was carefully staged to be completed over two construction seasons to maintain continual access to MOA and Ikea during construction. The SRF/KHA team, together with the City of Bloomington and the project contractor, C.S. McCrossan, scheduled all roadway closures in a manner that minimizes impacts to local roadways, parking lots, and mall and nearby business operations. The SRF/KHA team also accounted for busy shopping seasons by allowing key intersections (Ikea Way / Lindau Lane and 22nd Avenue / Lindau Lane) to remain open for back-to-school shopping in August through holiday shopping in December. The South Loop District includes some of the region’s most heavily traveled corridors. In addition to maintaining access to key retail destinations, the team also focused on providing the traveling public safe and efficient access to nearby destinations. The SRF/KHA team developed a detailed traffic management plan (TMP) in order to effectively move vehicles, pedestrians, taxis, busses, shuttles, and emergency vehicles through construction zones. A thorough communication strategy to communicate parking and transportation options. Work zone traffic control plans and intelligent work zone devices to manage traffic on area roadways impacted by construction. Regional wayfinding dynamic signs to guide visitors travelling by car to less-congested routes and available parking facilities. Temporary static/dynamic local wayfinding signs with remote monitoring and message revision capability to guide motorists in and out of the area. Temporary traffic signal design and timing plans adjusted according to volume and staging changes. Pedestrian routing signs and messaging to ensure safe pedestrian travel. While public safety is always a priority, it is an especially important design consideration given the MOA’s status as a major tourist attraction. The SRF/KHA team analyzed the risk of threats to the project’s two major structural components (the bridge and vehicle/pedestrian plaza and retaining walls at the east and west approaches), and developed a design that best accommodates structural safety and stability. A comprehensive risk analysis included preparing a data security plan that ensures confidential data is protected. The Future of MOA. As of August 2013, construction is nearly 50 percent complete. When finished in 2014, this project will help facilitate future MOA expansion, leverage access to key (ground-level) real estate, and create a distinctive mixed-use urban center. View additional information regarding future MOA expansion.